Yes, We Are Back ... One More Time, With Feeling! The people of Rhode Island have had enough of the giveaways! For far too long, our state's elected officials have colluded with their campaign funders and the state's power brokers to take advantage of the fine people of Rhode Island. Two years ago, James Skeffington's ludicrous proposal to move the Pawtucket Red Sox to the most prime parcel of land in the state was just the latest in a long line of taxpayer funded economic sinkholes that continue to hamper the economic resurgence of Rhode Island. The Coalition is supporting and promoting a massive call-in campaign to officials in Providence and Rhode Island to firmly state that we will no longer tolerate lining the pockets of the crony capitalists that have bought and sold our elected officials. In the spirit of civil disobedience and peaceful protest, we are asking Rhode Islanders to flood the switchboards of the Statehouse, Providence City Hall, and your local state representatives and senators. On Wednesdays, from 2- 3:30 p.m., call Governor Gina Raimondo's office at (401) 222-2080 or email the governor here. On Thursdays, from 2- 3:30 p.m., call Providence Mayor Jorge Elorza's office at (401) 421 2489 or email the mayor here. On Fridays from 6- 8 p.m., call members of the House Finance Committee. Their numbers are below. "Hello, my name is (your name), and I am a resident of (your city/town) and I am completely opposed to spending any current or future state and/or local tax revenues to finance privately owned sports facilities located anywhere in Rhode Island. 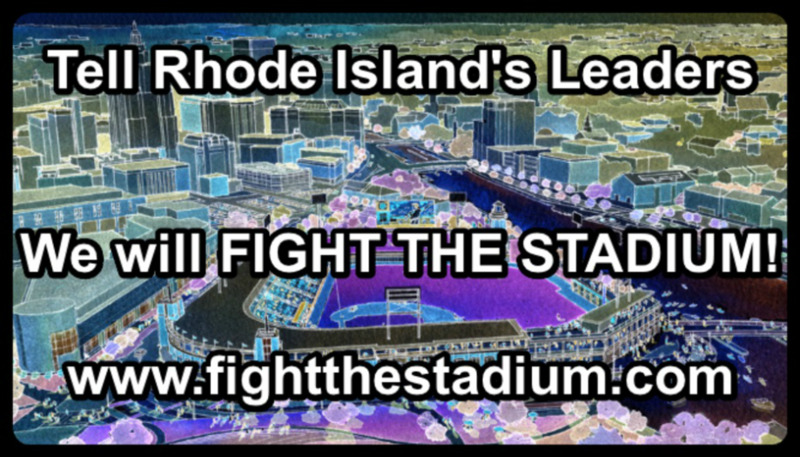 Years of study by sports economists have concluded that these taxpayer subsidized stadiums and arenas have little to no real economic impact on their host communities, and only serve to increase and prolong the public debt burden placed on the already overtaxed people of Rhode Island. We ask that you make these calls every week until we, the people of Rhode Island, get a definitive, "No!" from our state's leaders on public financing of privatized profit. Please comment below, and SHARE THIS PAGE on your Facebook timeline and on Twitter. Get updates on Facebook, and follow us on Twitter @NoPVDStadium.